Baby Boomers are steadfast and drawn in by reliability! Generation X is cynical and always looking for a bargain! 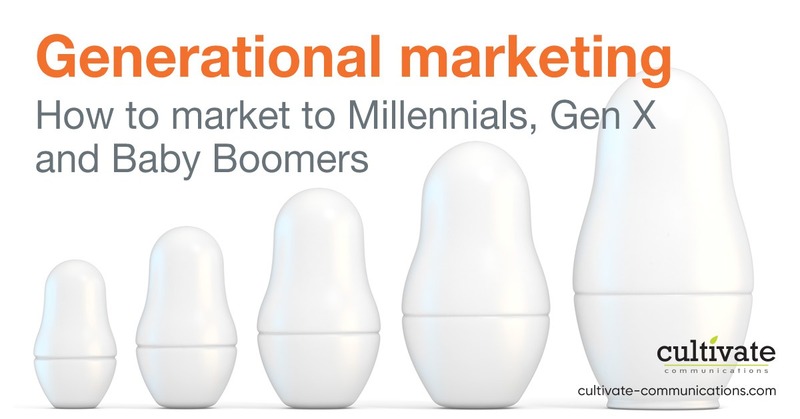 Making heads or tails of the generational differences and similarities (let alone coming up with a marketing strategy) can leave any marketer scratching their head, regardless of their own generational viewpoint. It’s a challenge to identify the common traits amongst your audience and to know what they want. Most businesses simply focus on marketing trends and follow the next big idea. At best, they concentrate on their ideal segment and target their marketing efforts there, because, well—it’s hard to be everything to everyone. But if you don’t understand generational marketing, you may not be reaching all of your ideal audience members…and you could be missing out on connecting with potential leads. What is Generational Marketing (and Why is it Important)? At the heart of it, generational marketing is a marketing approach that segments the population by the time period they were born. Each person (and thus each generation) is powerfully shaped by world events, trends and developments occurring when they come of age. Think of the Vietnam War and what it means to Baby Boomers compared to what 9/11 means to Millennials. The importance of each generation plays into marketing because whether Baby Boomer, Gen X or Millennials—that generational influence shapes the values and communication styles of the consumer. At the core of marketing strategy are demographics: data and information about your customers. Using that data to connect with your target audience is what gives you a marketing advantage. After researching your customer, you may discover your target customer fits solidly in one demographic, but for most businesses, the target is spread across several generations. This means you must learn to craft your marketing message to each generation in a way that resonates with them. If we examine the generational spread, we see 30% of the overall market is made up of Millennials, 27% Generation X and 30% Baby Boomers (the youngest Generation Y and the older Silent Generation comprise the difference). Essentially, if you don’t use strategic marketing to all three of the main groups, you could end up missing out on a third or more of the consumer base! For most businesses, that’s a scary prospect. Now, maybe your target audience is very specific. For example, let’s imagine your business designs children’s lunchboxes—the perfect product for parents of elementary school kids! It seems logical your demographic is between age 25-45: Millennials and the tail end of Generation X. Your marketing efforts are focused on the young parent—how to add convenience and simplicity to their lives. Knowing your demographic, Millennials are tech-savvy and primarily swayed by influence of their peers, you might reach out to Influencers: bloggers and Pinterest-loving moms, and perhaps focus your social media efforts on Snapchat and Instagram. Knowing Generation X seeks discounts and coupons, you may throw in a coupon deal or a BOGO sale. BUT, a closer look at your demographics might surprise you. 2.7 million grandparents are raising their grandchildren (a steady 7% increase since 2009). If you don’t include strategies to reach those Baby Boomer grandparents in your lunchbox marketing efforts, you’re missing a big audience! While you can’t be the perfect fit for every consumer, you CAN learn what appeals to each generation and use it to shape and diversify your strategy. In our example of marketing lunchboxes, a simple shift to include additional Facebook marketing could reach your grandparents. While we often think of Millennials as the tech experts, Baby Boomers are surprisingly comfortable with Facebook. The biggest pet-peeve of this generation? Feeling ignored or overlooked by Millennial-focused marketers! Understanding that the Baby Boomer Generation values quality, so they’re willing to spend a little more on a product they feel is high-end and lasting may also help shape your strategy. All of the generations are now active online shoppers. Although you might not see Boomers oversharing their personal information on Facebook, rest assured, they’re on Facebook and it’s a good way to reach them. Demographics are one of the most powerful tools in a marketer’s arsenal. Knowing who your customers are is the first step, but understanding what they want will help you take it deeper. Build a strong relationship with your customer by reaching them in a way that truly resonates with who they are and what they value. Need more specifics? Want to take a deep dive into each generation and what they really want? Learn how to reach Baby Boomers, Gen X and Millennials too! Are you ready to know your audience better? Download our free guide on Generational Marketing. We'll show you how to market to Millennials, Gen X and Baby Boomers ... sharing what you'll need to know about marketing to each generation!